Dance in the middle of Balboa Park to Charlie Chavez y Su Afrotruko, one of San Diego's premiere live salsa bands! DJ Tumbao will also be playing salsa, bachata, merengue and reggaeton.... all for a good cause. Beginner salsa and bachata dance class by Frankie & Sadie from Suave Dance Co. Performances from EnRuedaMe Mas (Tim & Rocio's group), San Diego Island Touch, Alma Latina, and many more! All proceeds will go to support Students Helping Honduras' "Train for Change" project - A teacher training program that will provide life changing educational opportunities to more than 1 million children in the most impoverished areas Honduras and Latin America. COST: Tickets are just $15 online and $20 at the door. There is still time to get your ticket online now (Friday), just click this link. Central American food and drinks will be available for a separate price. It's that time again to break out in rueda de casino and Cuban salsa suelta in Escondido at the Center for the Arts. Manny Cepeda will be playing so it will be a blast. It's free to the public so we plan to have our rueda practice at this place. Get ready to do some awesome ruedas and capture the fun happy vibe in Esco (Escondido). Our ruedistas from Esco will be there early at 6pm to get the party started early. I will be bringing my music for dancing. Due to a high demand of requests, I am opening registration for my One-Month Fall Beginners Series for Level 1. This is series is for anyone who has never danced Cuban salsa before. If this describes you, then this class is for you. 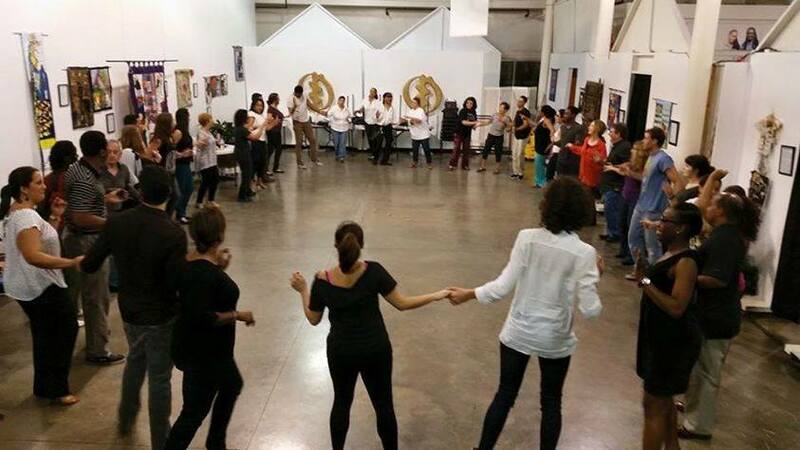 If you want to learn rueda de casino before this series starts and learn the basics, it is highly encouraged to take the beginner's 3-day bootcamp intensive at the 1st San Diego Cuban Dance Congress Oct 13-16. Click here for more details. This is taught by the best instructors around the country and local area. That's a 3-day intensive is $175 on Oct 1st and thereafter. Or, you can take Maritza's class after the congress is over. To sign up: please complete this Google Registration Form and then pay cash on the first day of the class. Registrations accepted until the day before the class starts. This is a private dance studio in Doug Simon's property. The studio is a yellow-painted separate garage-turned-dance-studio. There will be an A-frame sign that says: Rueda De Casino a.k.a. Cuban Salsa class at the entrance of their drive way. Go past the first house on the left side. Look for the "BLUE reflector lights" off of Iris Lane. Plenty of parking nearest the house. 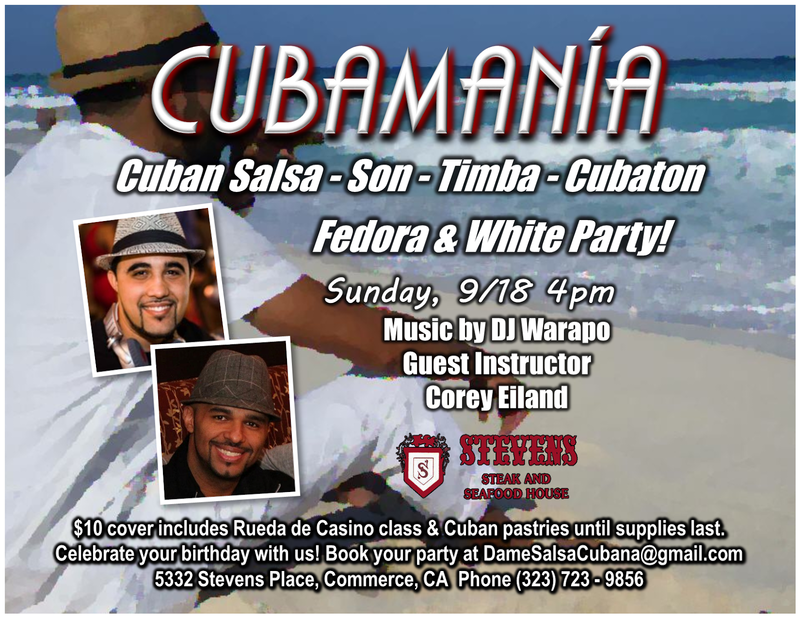 WHITE THEME CUBAN DANCE PARTY ** Matinee 4-9p.m. Wear White, wear a Fedora and be ready to party with us a lo cubano as we say goodbye to the summer! An afternoon of non-stop Cuban salsa, Timba and Cubaton with DEEJAY Warapo. Rueda de Casino Class with Guest Instructor Corey Eiland from Orange County! We will have complimentary pastries from Porto's Bakery (until supplies last). $10 cover includes class and Porto's Cuban pastries (until supplies last). ✔ FREE ADMISSION IF YOUR BIRTHDAY IS IN SEPTEMBER- MUST SIGN UP for our GUEST LIST! CHILDREN WELCOMED. No charge for Children under 16. 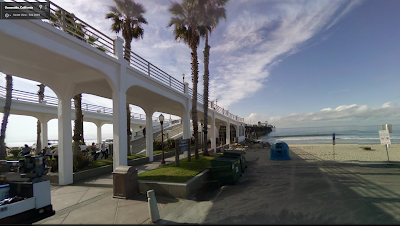 Come dance outside with us in Oceanside. Rueda at the Oeanside pier. This is a public rueda practice and a social time. All casineros are welcome no matter what level. Just come for some dancing. We are also celebrating 3 birthdays in September (Ziba, Veronica and Roi). We have a cake and have the Cuban Birthday song. Come join our fun North County rueda group. We are growing! HOW TO PREPARE: Wear layers, flat shoes you don't mind scuffing. We will be on concrete with some sand. Bring water and some snacks to share. We will go have a late dinner together afterwards! Come dance and break bread together. Free rueda class at Level 3 beginner level/Intermediate Level 1. We are practice our social dancing with some simple 1-eight-count moves. Get ready to learn paseala, exhibela, paseo inverso (a.k.a. rodeo). 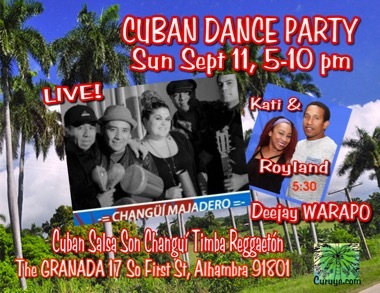 CURUYE.COM, KATI, & The GRANADA invite you to a very special CUBAN DANCE PARTY on SUNDAY, SEPTEMBER 11, 5-10 PM! SABROSO! CHANGUí MAJADERO plays LIVE CHANGUÍ, & SON, the roots of SALSA, with very special guest, visiting Cuban dancer, ROYLAND LOBATO! Between sets DEEJAY WARAPO will be dropping those hot contemporary Cuban dance beats they’re dancing to from Havana to Santiago de Cuba including CUBAN TIMBA, RUMBA, and REGGAETÓN! To enjoy the band to the max, you’re invited to take a class in CHANGUÍ and SON with ROYLAND and KATI HERNÁNDEZ at 5:30 pm. Hopefully they’ll also give a demo of how these rhythms are danced in Cuba to appreciate the Cuban phrase, “EL SON ES EL MÁS SUBLIME! ” (’Son is the most sublime!”). Along with al you dancers, KATI’s PA’ LA ORILLA DANCE TEAM will keep it happening on the dance floor all night. Chef Israel has a varied menu for hungry dancers. He has added some special Cuban dishes for us including Curuye’s fave lechón asado (lroasted pork) with black beans and rice among the entrees. We’ll be celebrating September birthdays ALMA ÁLVAREZ SALAZAR, RICARDO SALAZAR with a special Cuban Birthday dance! SPREAD THE WORD! LOOKING FORWARD TO BEING BACK at The GRANADA and DANCING WITH YOU ALL! We are honored to bring together CHANGUÍ MAJADERO, the Los Angeles-based band who specializes in CHANGUÍ, and CUBAN SON, the dance music born in eastern Cuba: Guantánamo and Santiago de Cuba, together with ROYLAND LOBATO from Guantánamo, graduate in DANCE from Havana’s esteemed SCHOOL of INSTRUCTORS of the ARTS, and founding member of Cuba’s renown 7 POTENCIAS folkloric dance company. Royland has performed and taught Cuban folkloric and popular dance internationally, and currently lives and performs in the Bay Area. 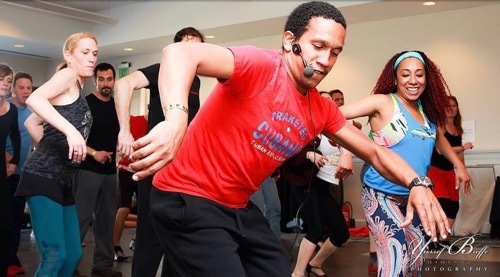 In L.A.: ROYLAND LOBATO: TEACHING 4 AFRO CUBAN DANCE WORKSHOPS SEPT 10 & 11! Cuban dancer ROYLAND LOBATO in L.A. SAT & SUN, SEPT 10 & 11! Cuban dancer ROYLAND LOBATO from Guantánamo, is a graduate in DANCE from Havana’s esteemed SCHOOL of INSTRUCTORS of the ARTS, and founding member of Cuba’s renown 7 POTENCIAS folkloric dance company. Royland has performed and taught Cuban folkloric and popular dance internationally, and currently lives and performs in the Bay Area. To PRE PAY and RESERVE YOUR SPOT, CLICK HERE.